Our old stone, rustic villa, surrounded by a private, tranquil Mediterranean garden is near the beach and a great place to relax. The living area, kitchen and bathroom are on the ground floor. The sleeping area, consisting of 3 bedrooms, and a bathroom is on the second floor. The house is surrounded by a beautiful flowery garden, with an olive, mulberry and fig tree and pergolas covered with vines. The garden is hidden from sight by stone walls. The outdoor kitchen and the bathroom are also made of stone. The whole village is hidden within the oak forest. The Villa is in walking distance (only a few minutes) of the local beach. On the hilltop is Rezevici Monastery, XIII c. There is a grocery shop in the center of the village 50 m from the house, and a restaurant on the beach. Hiring a car is needed to go to the market and restaurants in Petrovac (2km) or to go to night-clubs, casinos, restaurants and concerts in Budva(20km). Banks, exchange offices and medical facilities you can find both in Petrovac and Budva. I'm 50 years old historian of art. I am a widow. My late husband was a mechanical engineer, specialized for environmental control. We have a daughter who is 20. She studies International Affairs and Media. My parents bought this house when I was a baby, so we own it for a really long time :). We love our house very much. I have to admit that I actually don't like renting my house at all. But, considering how much we are pressed with work and the other obligations, and how little time we can spend there lately, we decided to rent. We try to rent it to the nice people. My family loves this house. 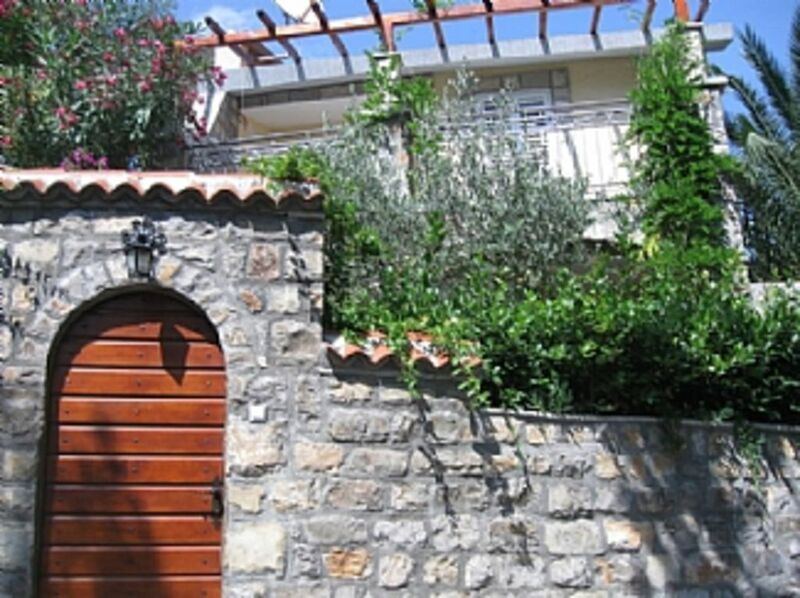 It is a stone-made mansion, build in a rustic manner, surrounded with a green Mediterranean style garden. There is a big fig tree in the back of the house, I used to climb on when I was a child, and my daughter continued that tradition. There is also an olive tree, a mulberry tree and a palm tree in my garden too, making shade and giving fruits. The garden itself is surrounded with stone walls, with old wooden ports on both sides. The beach is only a few minutes away by foot. I especially love the water there, I just can't stop drinking it. It is because the water in our pipeline comes from the mountain spring which gives the water exceptional quality. I also love the fact that most of the places worth seeing in Montenegro are easy to reach - Budva with its restaurants, the old Capital Cetinje, Lovcen mountain, Skadar Lake which is beyond beautiful with its numerous islands and the medieval churches on them, the mouth of Bojana river to the sea, where the longest sand beach in Europe is situated (really good place for kiting I must say) and also a naturist camp... everything is from 15 to 80 minutes of drive. There is a 13th century medieval monastery on the hill above our village, so the church bells are echoing across the sea every morning. The whole village is built in the oak forest, so it is quiet and green. The birds are singing in the trees in the morning, and the squirrels are playing in the sun. The beach is nearby, only few minutes of walk downhill. It is partly pebbly, partly sandy. The entrance to the beach is free, unlike other beaches in Montenegro. Although our village is hidden from all that summer crowd and noise, all the places for evening entertainment - restaurants, bars, casinos, open air theaters etc are only ten minutes of drive away. The choice is yours! 2 bathrooms (one on ground, and one on first floor), with shower- cabins. 1 stone-made garden bathroom with shower. Dining table with chairs, sofa that can be transformed into a double bed, TV, video, CD-player. Stove, oven, fridge/ freezer, dish-washing machine, standard kitchen facilities - blenders, mixers, machine for making and baking bread, dishes for cooking and serving. Notes on accommodation: Villa is air conditioned. Central heating for cooler months. Wireless internet connection available. Outside: Beautiful, green, shaded garden surrounded by stone walls. There is outdoor kitchen in the garden, with a barbecue place, stone-made dining table with benches below the pergola covered with grapevines, and two rustic wooden tables with benches, one covered by a roof made of pitoresque hand-made slates. Utility Room: vacume-cleaner, iron/ironing board, washing machine. Cleaning / Towels / Linen / Towels and linen are included. Cleaning of the house and changing towels and linen every week. Please bring your own beach towels. The house, village, and the beach are perfect. House is really perfectly design for hot summer here, kitchen build outside in the garden (there is also one inside) and tables outside are great. There is a perfect barbecue outside and great selection of fish can be obtained from the fish market in Bar. Village is quite and beach is really excellent with just few people, no music no entrance fee. Water is perfectly clear. Place is a good starting point for numerous trips, places like Skadar lake, Kotor, Perast, Lovcen, etc. can be easily reach by car within about one hour drive. This particular place is ideal for peaceful family holiday. It can be interesting for people who like scuba diving, walking pedestrian tracks, or visiting medieval monasteries (there is abundance of such sites). But, vicinity of Sveti Stefan and Budva gives a lot of opportunities for more active holiday and night- life. Local beach is only a few minutes walking distance. Entering this beach is free, with a possibility of renting beach accessories. Beautiful beach Drobni Pjesak is about 5 minutes by car. There are also beaches in Milocer, Sveti Stefan. Some of these beaches are pebbly, but very beautiful. The biggest sandy beach on this part of Mediterranean is near Ulcinj, some 60km to the south, an ideal place to try kite, and have a good meal in some of excellent restaurants on the mouth of river Bojana. Two Montenegrian airports - Tivat and Podgorica are on the approximately equal distance of about 40km from Perazica Do. Croatian airport near Dubrovnik is also available, because it is not far from the border with Montenegro. 2km (5 minutes by car) to the Petrovac. There is also pedestrian track by the sea, and through the pedestrian tunnel and pine forest on the other side, to the Petrovac. It is less than 1,5 km long. 10km (10-15 minutes by car) to the Sveti Stefan. 15km (15-20 minutes by car) to the Budva. There is only one little grocery shop in the center of the village. Anything you can't find in this market, you can order from the shop owner, and it will be delivered to you. For the bigger shopping, there are supermarkets and green market in Petrovac, Budva, and Bar (25 km. to the south). Booking Notes: A 50% deposit is required at the time of booking and the balance 4 weeks before arrival. Changeover day should be Saturday or Sunday, but we are flexible to your needs and changeover days will be altered if possible.